The weather was chilly on our first days here and I was glad I had knit myself a new scarf for the trip. Yesterday and today it has warmed up considerably during the day, which is what I expected, nay, demanded for my stay in Jerez. Warm days and cool nights- this was what it was like during the last trip. The change came during siesta yesterday afternoon: I went outside and was impressed by the warm air. In contrast, I had to wear my woolly socks on the walk to class in the morning. 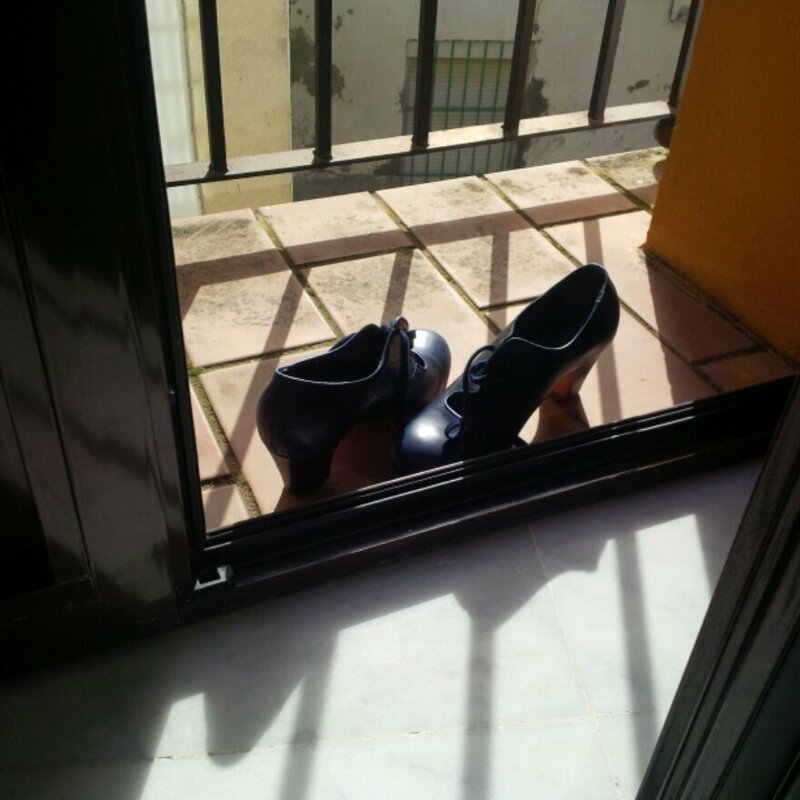 I have bought new flamenco shoes. They are neither black nor an audacious colour, both of which I was promising to purchase before my trip. They are navy blue and of the Senovilla brand. I thought I didn’t like Senovilla, because last trip I tried on many pairs and they always felt too wide in the toe. The trick, however, was that I was only trying the styles with straps and buckles, not lace-ups. The lace-ups fit fine in the toe: nice and snug. And in beautiful navy blue. Now as I think of it, they are probably fading in the sun as I have put them out on my little veranda to air out. Today I did something I’ve never done before: drunk a beer in Spain. I still don’t like beer. I only bought it so I could sit down while I connected to free wi-fi. €1.50. So glad you’re doing a blog! Look forward to reading all the antics you get up to…oh, and the dancing too!